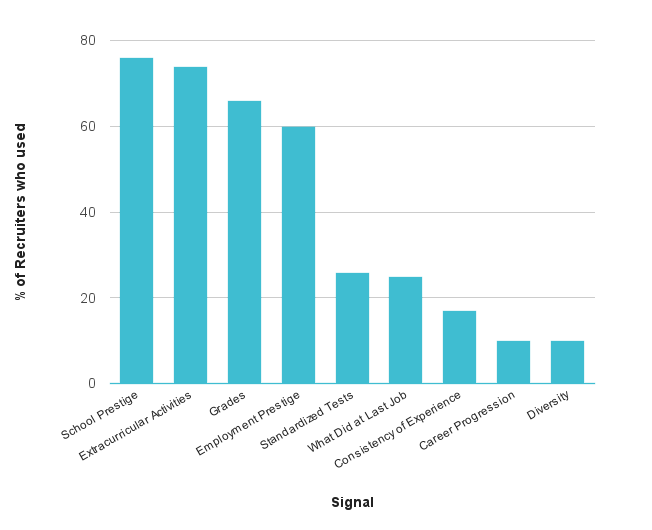 Here’s a chart showing the key signals that recruiters used to screen candidates. This isn’t to say that coming from a prestigious school is required to get these jobs – there are many cases of people who get them without – just that it’s going to be much harder. [When screening candidates…][E]valuators tended to do so very rapidly, typically bypassing cover letters (only about fifteen percent reported even looking at them) and transcripts and reported spending between 10 s to 4 min per resume. Steve Hsu points out4 that elite jobs can be roughly divided into “hard” and “soft”. This study mainly focuses on “soft” elite jobs like consulting, law and deal-making investment banking. The “hard” elite jobs are those in trading, hedge funds, venture funds, technology and startups. In these, performance is easier to measure and raw intelligence is more important, so recruiters put more weight on standardised test scores, track record and academic record, and less on school prestige. The soft firms know that what they do isn’t “rocket science” — it just isn’t that hard, and any academic admitted to a top university is smart enough. They just have to appear elite and smart enough to snow their clients and sell the work. Jim Manzi responds5 that the big three strategy consulting firms seem to put more emphasis on standardised test scores than the study suggests, and says there’s a shift in consulting and finance towards a greater proportion of “hard” jobs vs. “soft” ones. All of these commentators are focused on the US. I expect the results would be similar elsewhere in the rest of the developed world, but can easily imagine differences in emphasis.